Mercedes-Benz has revealed the new E-Class, promising “a big step into the future” from the new executive saloon, which will hit UK showrooms in spring priced from around £35,000. The new E-Class adheres to every new model trope by virtue of being bigger, more technologically sophisticated, more efficient and, probably, slightly more expensive than the car it replaces - final prices are yet to be announced. Headline new features include an ability to un-park it from a garage (or anywhere) remotely using a mobile phone (a phone can be used as the car key too), a car-to-car communications system that allows it to receive advanced warnings from other vehicles about forthcoming danger, and a side-impact collision system that shunts the seats further into the car and out of harm’s way if necessary. The more prosaic stuff is covered too, with the car dedicating a 65mm longer wheelbase to passenger space and coming with a brand new four-cylinder 195PS diesel engine in the E220d model, boasting 102g/km CO2 and 72.4mpg combined. The other engine at launch in the UK is a four-cylinder petrol unit in the E200, with 184PS, 132g/km CO2 and 47.9mpg. 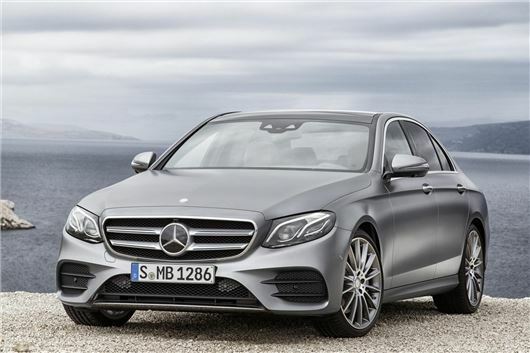 Later in 2016 the 3.0-litre six-cylinder E350d diesel will arrive, with a whopping 620Nm torque and 258PS propelling it to 62mph in 5.9 seconds, returning a 55.4mpg average; the E220d that most will purchase does the benchmark acceleration test in 7.3 seconds. A petrol-electric hybrid, badged E350e will arrive late in 2016 too, packing a 279PS total output yet just 49g/km CO2 emissions. Every E-Class comes as standard with the latest 9G-Tronic nine-speed automatic gearbox, and while steel suspension is standard too it comes with selective damping. Air suspension can be specified as a cost option, with a greater degree of customisation available. The interior of this, the most advanced Mercedes-Benz ever made – including the latest S-Class – is as plush as you’d expect, and optionally available with twin 12.3-inch widescreen HD displays, one of them serving as the instrument cluster and both housed beneath the same glass panel. The steering wheel buttons are touch-sensitive too, meaning they respond to swipe gestures as per a mobile phone. Mercedes-Benz will offer an optional tail light configuration with a celestial aesthetic that the company says is inspired by the Milky Way, while it appears the interior has been influenced by a Mars Bar, designed with “various shades of brown colour [and] material,” according to the company. A variety of metal, wood and leather trims are available, while Mercedes-Benz has taken inspiration from the disco ball interior lighting of the MINI, offering a choice of 64 colours for the internal LEDs so that drivers can customise the glow of the cockpit. Other technology includes myriad driver assistance and safety systems, like Drive Pilot, the most advanced cruise control system yet committed to a production car. At speeds up to 130mph and on virtually any sort of road it will automatically keep the car a set distance from the car in front by accelerating, braking and steering as necessary. It will also change lanes for you on the motorway. The E-Class takes automatic emergency braking a step further too, not only performing that action if it senses an imminent collision with a pedestrian at low speed, but assisting in any evasive steering move too, including straightening the car up to avoid fishtailing. Another useful, if non-evasive, safety feature called Pre-Safe Sound emits a specific frequency noise designed to jolt the stapedius reflex in the inner ear if a crash is imminent. This immediately readies occupants for the sound of a collision – sometimes the most harrowing aspect of a low-speed prang – and makes it less harsh.